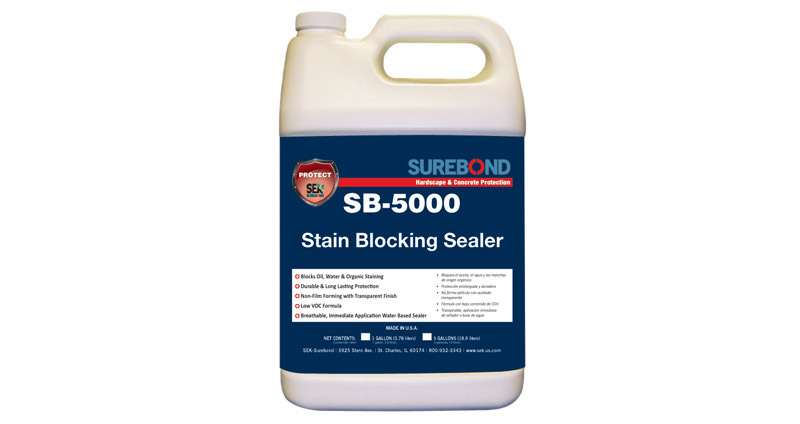 SB-5000 Stain Blocking Invisible Sealer is a water based, penetrating, low VOC sealer that provides an invisible, durable barrier against water, oil and stains on horizontal and vertical surfaces. Ideal for driveways, industrial flooring, building entrances, shopping malls, food courts and other surfaces at risk for oil, food and/or other staining. SB-5000 is an aqueous fluorochemical dispersion that does not contain any silicone or wax components. SB-5000 has the consistency of water and is milky white in appearance when applied and dries clear with an invisible finish. It can be used indoors and outdoors on both new and old surfaces. SB-5000 can be applied immediately, as its unmatched breathability will not trap efflorescence. SB-5000 requires two coats. Cured sealer is freeze resistant to -60°F (-51°C) and is stable up to a temperature of 180°F (82°C). Ideal for driveways, industrial flooring, building entrances, shopping malls, food courts and other surfaces at risk for oil, food or other staining. 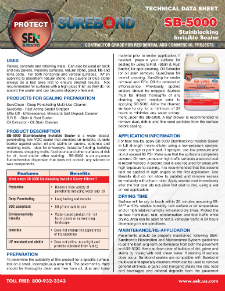 Suitable for concrete and clay pavers, masonry surfaces, natural stone, grout, unglazed tile and terra cotta. Not recommended for surfaces with a high gloss finish as they do not absorb the sealer. Per gallon. Coverage based on single coat. 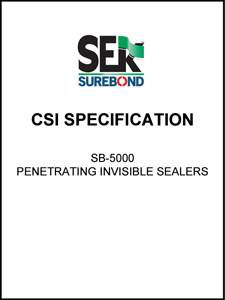 Some applications may require additional coats see SB-5000 Application Information. Actual coverage may vary depending on the type, age, condition and porosity of the surface, application method and other local conditions such as temperature. TEST FIRST on a small inconspicuous area to determine the suitability and if desired results are achievable with this product on your specific surface. On new concrete, SB-5000 should be applied once concrete is fully cured (30 days after installation) to ensure optimal performance. The surface should be thoroughly clean and free from oil, dust, loose material, and previously applied sealer other than SB-5000 prior to sealer application. If needed, prepare surface with Surebond Cleaners before sealing. Thoroughly rinse all cleaner residue prior to sealing. Allow the surface to dry for a minimum of 24 hours after cleaning and/or rain before sealer application. Use a leaf blower to remove dust, debris and fine sand particles from the surface before sealing. Cover/protect nearby landscape, vehicles, and buildings from overspray during application. Apply when day and night temperatures are between 40°F – 95°F. Avoid windy conditions to keep sealer spray from drifting. NO pre-blending or mixing required. For best results, apply SB-5000 at full strength (never dilute) using a low-pressure sprayer, roller, sponge or paint pad. Make sure that the surface is completely saturated. On new, porous or high traffic surfaces a second coat is recommended. A second coat is also required for areas with high exposure to staining. It is recommended that this second coat be applied at right angles to the first application. Use liberally (but do not allow to puddle) and remove excess immediately with a foam roller. Apply second coat immediately after the first coat (do not allow first coat to dry), using a wet on wet application. Re-applications may need to be carried out every five to ten years depending on weather and volume of traffic. 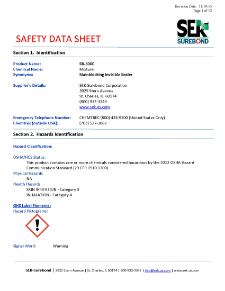 NOTE: Application of this product is out of the control of SEK-Surebond. Application steps should be followed completely and accurately. Should a problem occur with this product, SEK-Surebond limits liability to product replacement only. Buyer assumes all risk and liability resulting from the use or misuse of this product. Surface will be dry to touch within 60 minutes at 65-85°F. Low surface or air temperature will extend dry times. Protect the surface from dust, rain, condensation and traffic while drying. Area can be open to foot & light vehicular traffic in 24 hours depending on site conditions. For tools and equipment, use soap and water before product is allowed to dry.